We’re nearing Malta. That is to say that we shall be there tomorrow at 8 a.m., and we rather expect to land. […] Up at 6.30; shave and get into flannels; medicine ball and other exercises (a few of us); then a bath and breakfast; chess, a game or two of lawn tennis with a quoit, play the piano a bit, sketch a nurse or two, chat about; lunch, chess, lawn tennis till tea. Same again. Yesterday we borrowed the chief officer’s boxing gloves; I had a set-to with [Captain] Hogan; he made my nose bleed, I opened the place where he had cut himself shaving. Today there’s a regular boxing competition for the men; great excitement and crowd, hanging in everything hangable-in, to watch the ring. All in for a knock-out, I entered my name, but Hogan (who has been a prize fighter) scratched [it out]; said I was too old to run the risk of a knock-out. However, there’s officers’ boxing tomorrow; people seem to think I’m pretty hard and fit. And so I am. Had a concert last night; I played Sibelius’ Valse Triste and the accompaniments. Out on the deck, with a canvas windscreen; but a great noise of the sea. It’s as flat as a pancake. More news when there is any. Today (a Tuesday) Kittie left Hampstead for Kent, to stay first with the thirty-four-year-old Violet Pym and her children at Foxwold, then with Violet’s mother Catherine Lubbock at nearby Emmetts. George was adamant that Kittie should be with friends as much as possible whilst he was away. 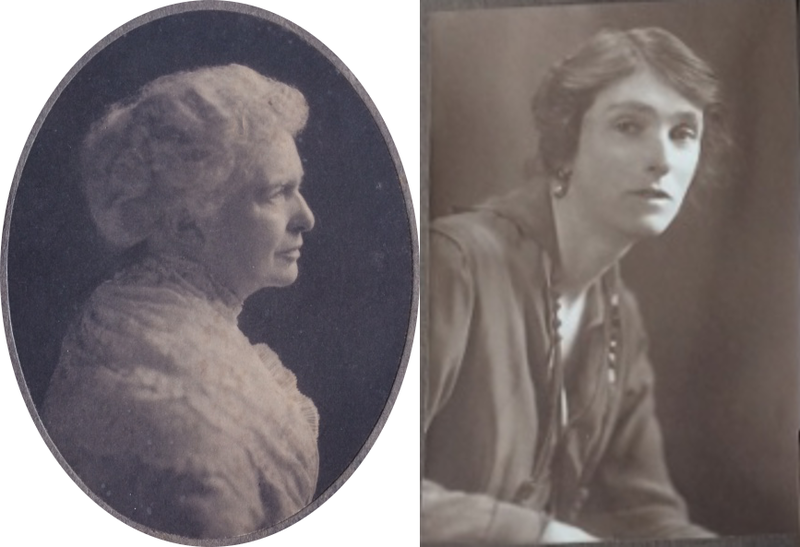 Left: Catherine Lubbock, 1920; right: her daughter Violet Pym, c. 1910. Reproduced by kind permission of the Pym family. At Anzac today the Turks opened a long preliminary bombardment at 5.00 in the afternoon. Their massed attack was due to begin at 3.30 next morning. On this occasion British naval air reconnaissance was good. General Birdwood, commander of the Anzac Corps, concluded that a night attack was brewing and stood his troops ready. This entry was posted in George Calderon, Timeline and tagged ANZAC, Captain Charles Evelyn Pym, Captain Hogan, Catherine Lubbock, Dardanelles, Foxwold, Gallipoli, General William Birdwood, George Calderon, Kittie Calderon, Malta, Sibelius, The Great War, Violet Pym, World War I. Bookmark the permalink.